Heat oil and fry anchovies till fragrant. Throw in the rest of the ingredients and seasonings. Mix well and add water. Cover and simmer for about 3 minutes. 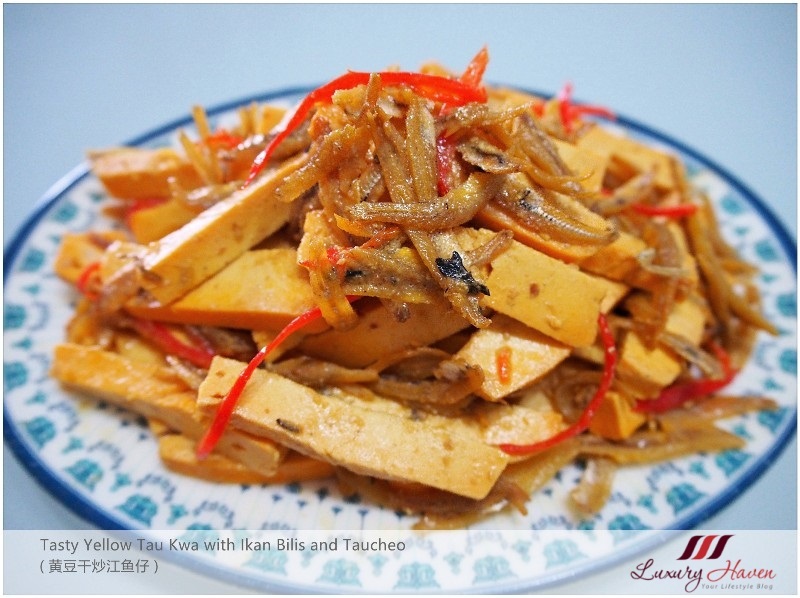 Transfer to serving plate and your tasty Unicurd Tau Kwa with Ikan Bilis and Taucheo ( 黄豆干炒江鱼仔 ) is ready for the table! 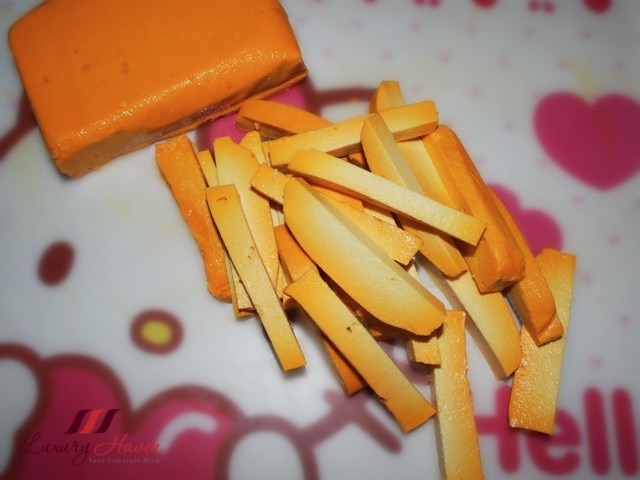 Have you tried these yellow bean curd? How do you cook yours? You have a great week, my dear. It looks very nice and colourful. Aiyo, I am hungry. My kind of typical Asian dish. Shirley, I love this dish! I can just have this one dish with rice (on my cheat day hah..hah...) or with a stir fried vegetable dish. What makes this taukwa yellow I wonder. When I was small, I remember yellow taukwa but those were artificial coloring and I don't see them anymore now. Are the beancurds made from non GMO soy beans? I love when you make dishes that seem exotic to me! I'd love to taste this wonderful starter!!! Looks so tasty! My husband loves dried bean curd especially in stir fry dishes. Yummy dish, but I don't get these ingredients here. I've never tried the yellow bean curd. Thanks for sharing this recipe Shirley. Always enjoy seeing you whipping up simple ingredients to enticing delicious dishes. This is new to me, Shirley. But something that's easy to prepare but looks that good...wow, I'd love to try it! This dish will be great with a bowl of white rice...so tasty! It looks tasty, Shirley. Would love to taste it. I've never tasted anything like it. I am so happy you shared this recipe! I tried it once and really wanted to recreate it at home. I have never seen a yellow beancurd. This looks so delicious, Shirley! Finger-licking! so yummy! you're a great chef. I would love to try this. Whoah!!! I can imagine the taste with hot steamed rice. WTH! You really know how to tempt me with good food.